The first is perhaps the most obvious. Pickles are delicious and taste very different from fresh cucumbers. That's at least two points for pickles when you are sick of cucumbers. The second way takes longer to explain. The best cucumbers to make pickles from are actually small to medium sized. The big ones can be saved for salads or (later) for seeds. Knowing that one is growing too many cucumbers and knowing that size matters it's not hard to select a few to be big ones and pick the majority at more suitable small to mid sizes. These will be crisper also, an important pickle trait. This helps reduce the overage of cucumbers as the ones you have picked small do not continue to grow and may also result in more cucumbers as the vine can provide more energy to new, even smaller developing fruits, which may in turn become more pickles. Store bought pickles are made with vinegar, and if you've ever made refrigerator pickles it is a similar idea. 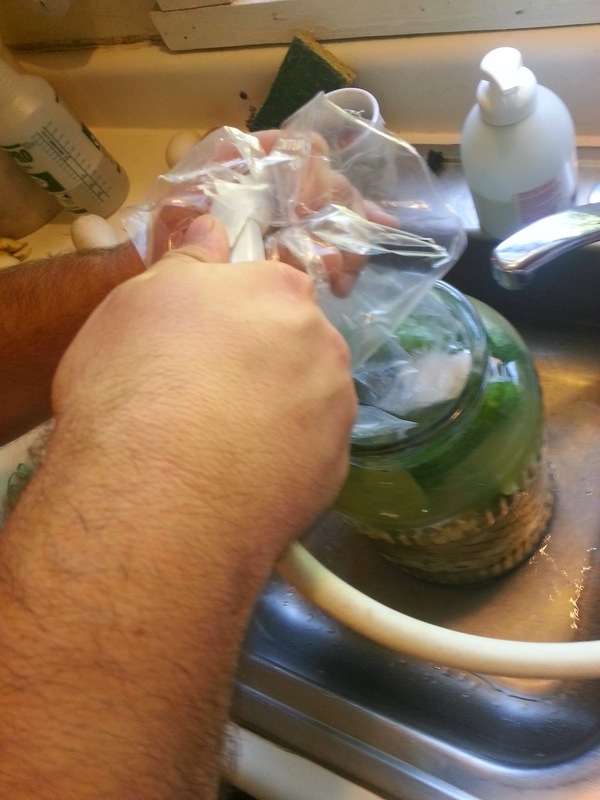 By steeping in the mixture for a long enough time the flavors and features of the "pickle juice" (technical industry term) turn the cucumbers into pickles. 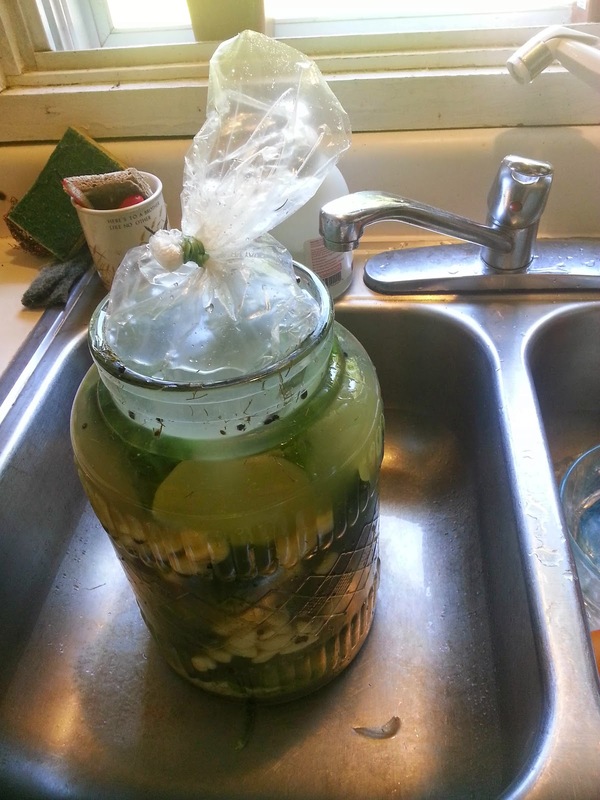 Real pickles are fermented. If you've ever had a deli-style pickle or a "half-sour" pickle it is an experience you will remember, as Sandor Ellix Katz confirms in his book just before jumping into the recipe itself. 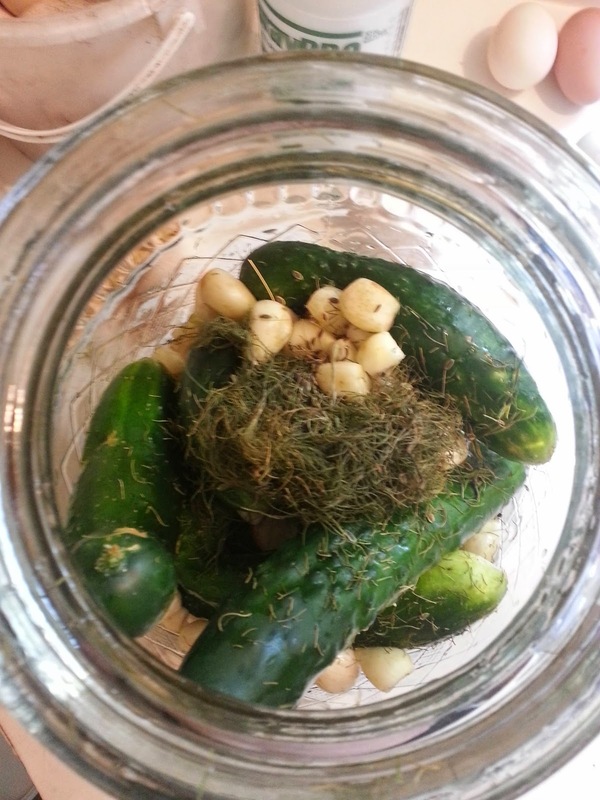 Sparing you the science, fermented pickles are lacto-fermented, much like sauerkraut. The microorganisms responsible for this are extremely good for you, probiotic to a point well beyond what laboratory probiotics can achieve and really, all these probiotics are up to is making vinegar. So the cucumbers, dill, garlic, and whatever other vegetables you might choose to add feed the microorganisms, which make the vinegar and the flavor which cures the pickles. All you have to do is give them a good place to live. This, again sparing the science, requires a bit of salt. 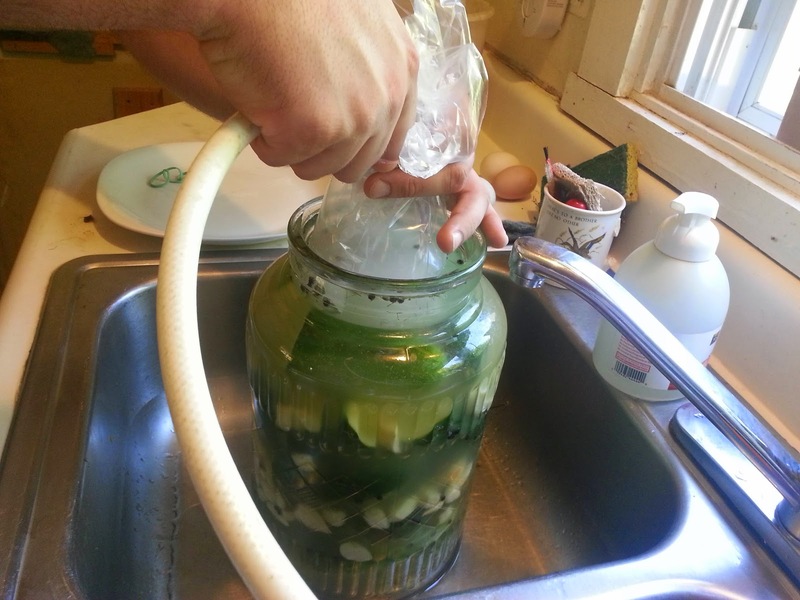 If you keep your pickles underwater (away from air) and in a salty brine you avoid the molds and yeasts and "bad" microorganisms that spoil food. What you get instead are the lactobacteria we want. That's all it takes. For more of course, you'll want the book. I love it, you will too. 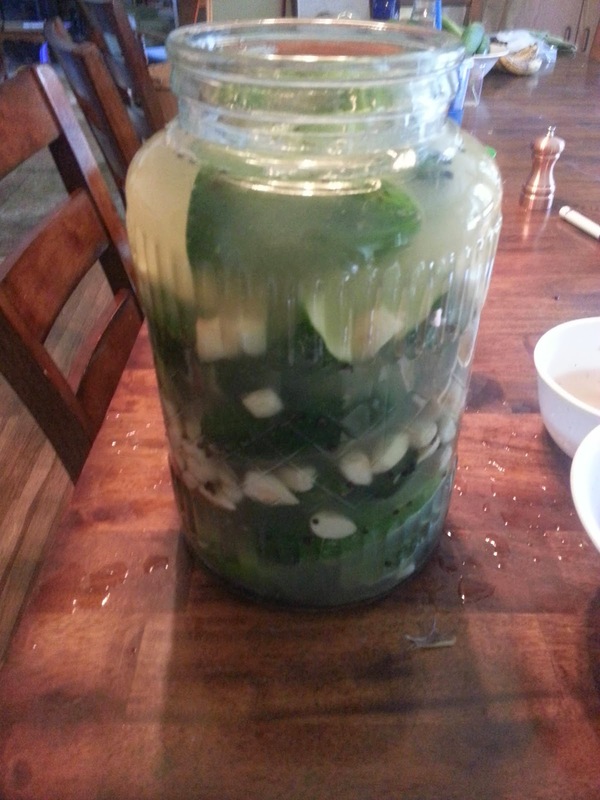 My "jar" as you'll see in pictures here is actually 2+ gallons while the recipe is sized for a 1 gallon container. 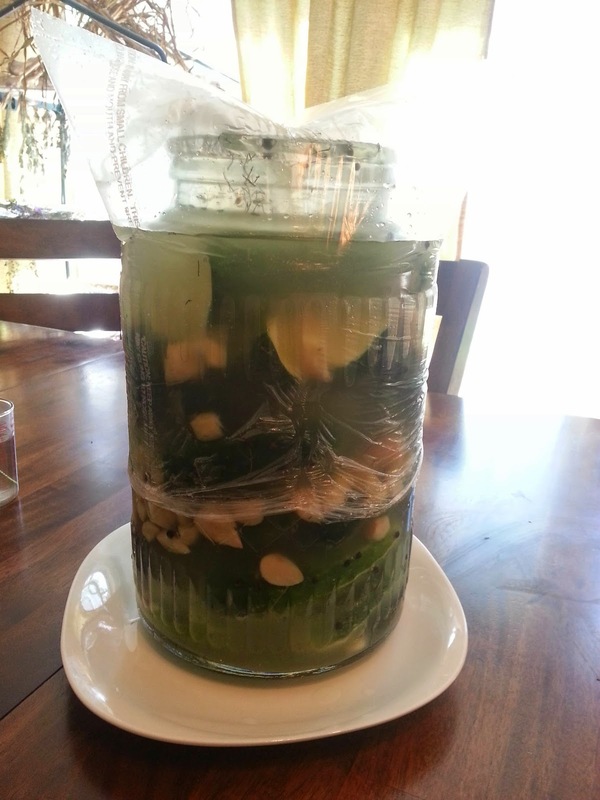 If you have an actual Fermenting Crock all the better, but any large enough jar or container will do. 1 gallon (or larger) ceramic crock or food grade plastic bucket. A plate (or weight ) which fits inside the crock or bucket. You will likely be starting with an empty container, if so make sure to rinse it out thoroughly after cleaning with a mild soap. I had sauerkraut ready to graduate to the refrigerator so my start (and your future starts) go a bit differently. After removing my original lacto-ferment I rinsed the jar without soap and made sure any area which needed more than a rinse is clean. Because my original lacto-ferment is handy, some of the probiotic liquid goes back in as a starter but otherwise the cleaning and prep is the same. Any ick or bad microorganisms that get in will get in now, so avoid them. 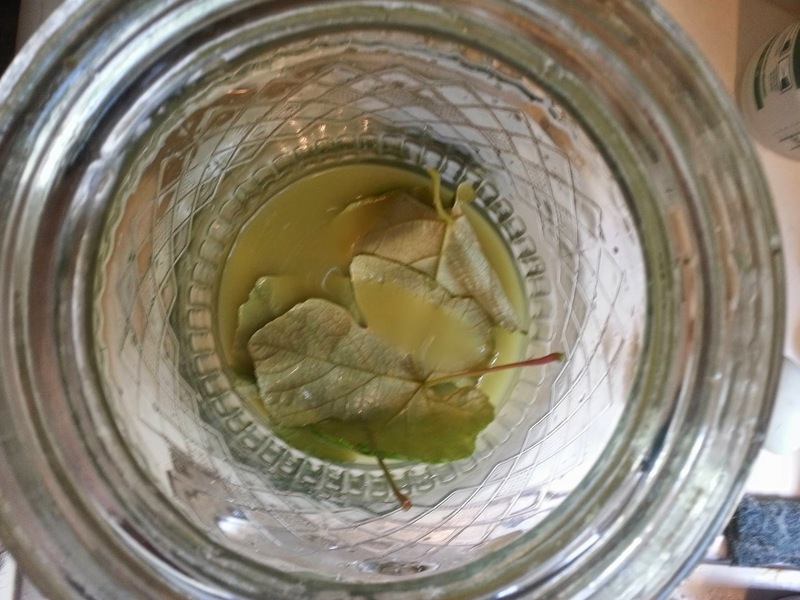 Place on the bottom of the jar: Half the leaves (I used grape leaves), the dill, your garlic, and the peppercorns. As I used so much garlic mine is visible throughout the process but Sandor's recipe suggests you place it all at the bottom. That "hairball" is my dill. 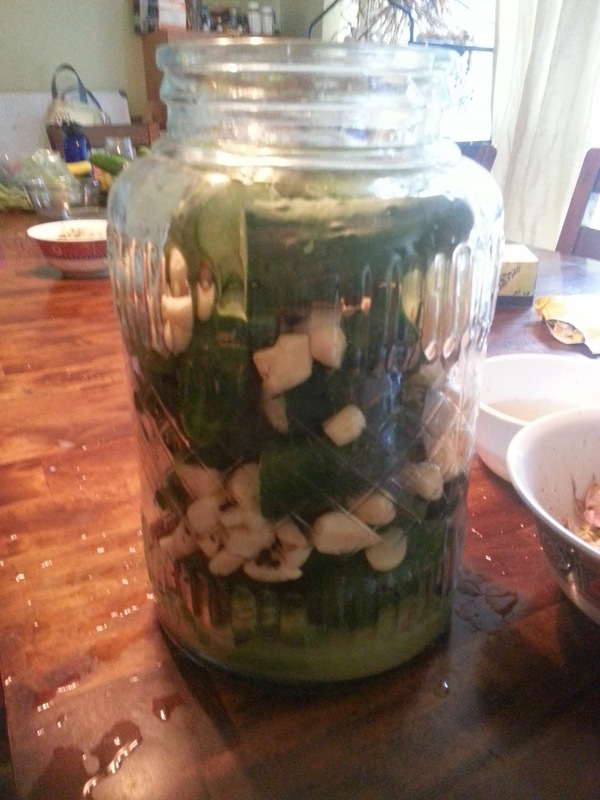 Fairly self explanatory, begin to layer your cucumbers in the jar. 4) Add any remaining garlic, dill, or anything you forgot. Sandor gives very specific volumes of salt and water in the ingredients list but he also provides some insight into the process which allows for more control on your part. Adding 1 Tbs.of salt to a quart of water yields a 1.8% brine solution. 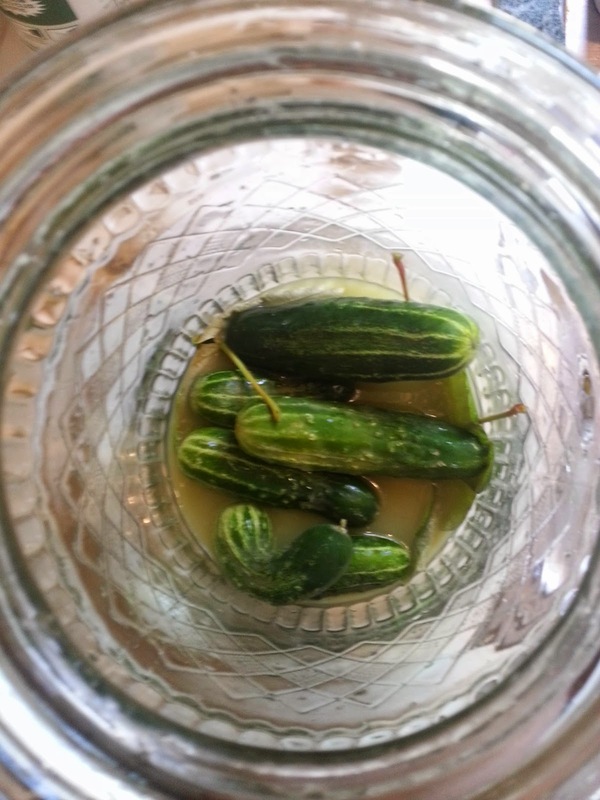 A "half sour" pickle is made with a 3.5% (2 Tbs/quart) brine and full sour pickles (and this recipe) use 3 Tbs/quart which is 5.4% brine solution. 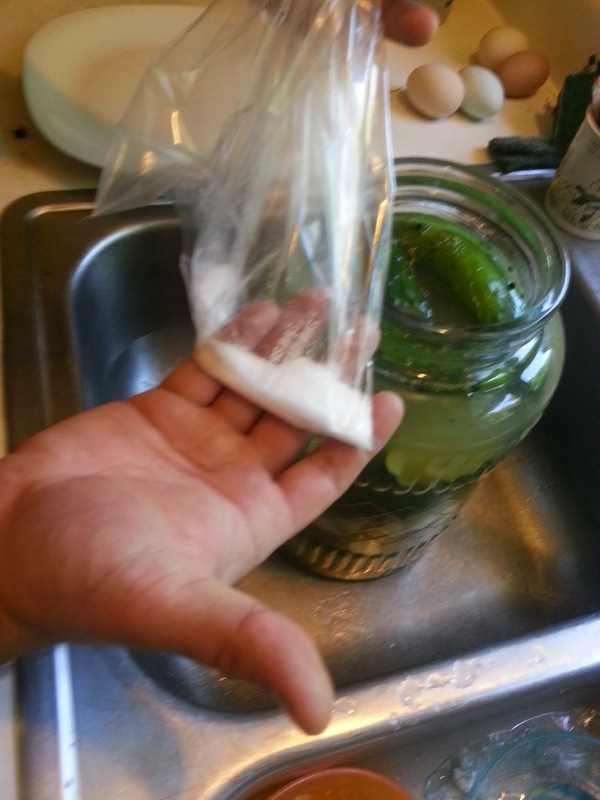 is from my kraut juice "starter"
Rather than mix the whole amount of water with the whole amount of salt I recommend doing so a quart at a time. Each quart gets salt based on the numbers above, and that way if your crock has a little more or a little less space you can adjust for it much more easily. Last but not least (and not pictured here, sorry) add the other half of your tannin rich leaves as a layer on top. Ready for a weight and cap. 6) Weighing down the veggies. As I mentioned before one of the goals of this process is to keep your food from being in contact with the air. If you have your crock and specially made weight this is easy. Simply place the weight on top and cover with a cloth to keep the dust out. For my jar a little bit more ingenuity is needed. Because the neck of the jar is narrower than the body my weight must fit through the neck but widen so no floating veggies can get by. A simple sandwich bag works for this. Add a litlte salt to the bag. If it leaks it won't dilute your brine. 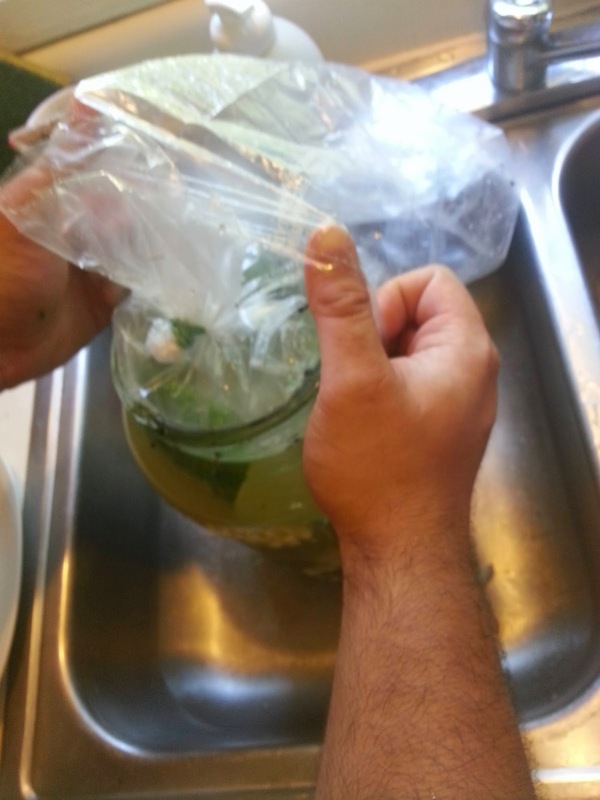 Place the bag in the jar, then add water slowly. As the bag fills it will expand beyond the neck of the jar, providing our needed weight. Twist, tie, fold over the bag one more time and tie again. brine level falls add water until it is back where it belongs. Little tight. Easy does it. A simple cloth cover to keep out dust and bugs is enough to do this, but as I will want to observe the jar closely (and everything else is already clear) I use another plastic bag. In this case, my bag fits fairly snugly around the jar, but yours need not. As long as the weight keeps the veggies down, all the second bag does is serve as a cover. 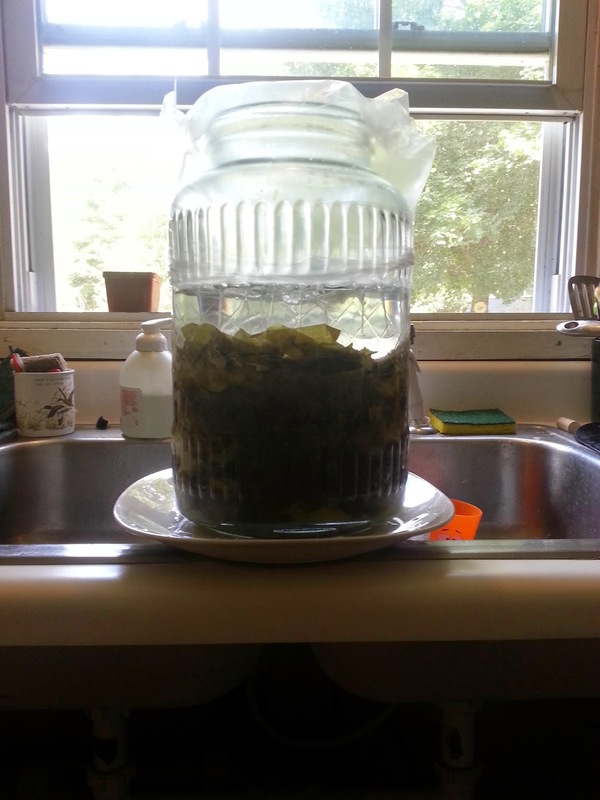 As the pickles ferment changes in air pressure or gas escaping the jar may cause some brine to push out of the jar (especially in my case as I try to get it so full) so I place my jar on a plate to catch anything that does. 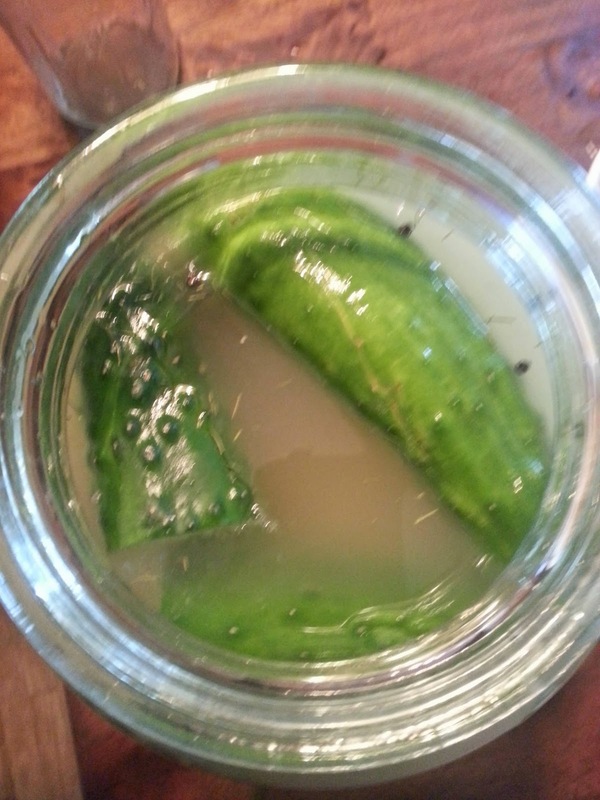 Depending on your brine strength and ambient temperature your pickles will be done in 1-4 weeks. Check the fermenter every day and if there is any mold or growth on the surface just skim it off with a metal spoon. 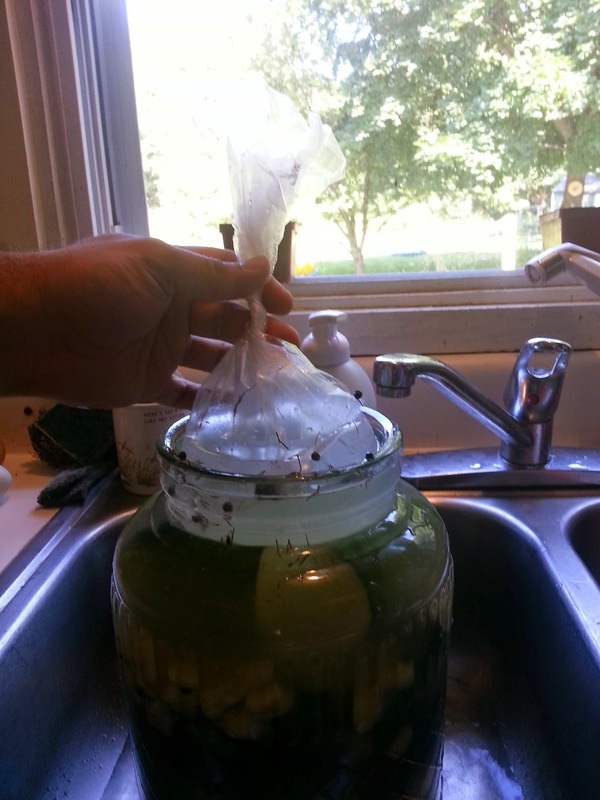 Mold can only live where it can get oxygen and your pickles are still safe. After a few days taste the pickles, they are "done" when they are right for you. When they are done, whether that is after a week or the full four, move your pickles into the fridge. Fermentation will continue even in the fridge but the cooler temps will slow it down greatly. 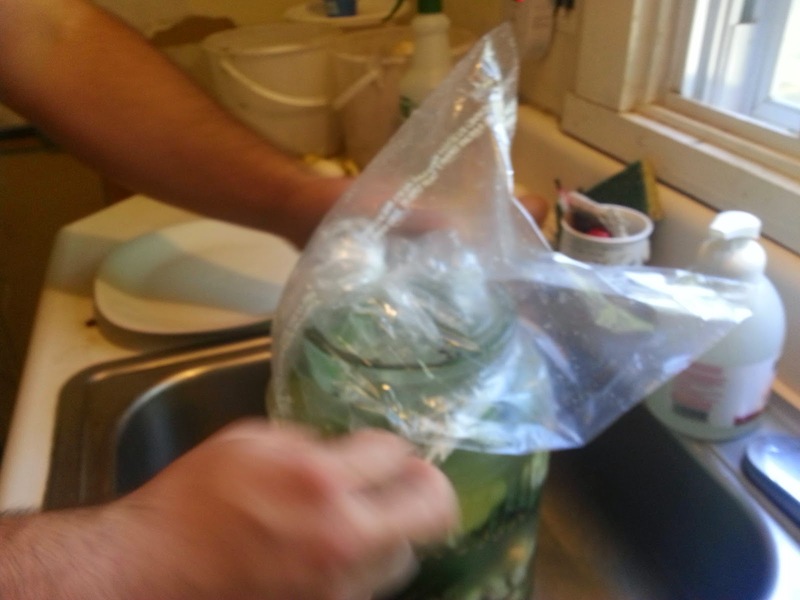 It is possible to ferment your pickles too long, if so they will get a bit limp. If you are tasting them to see if they are done and watching the fermenter daily you will get them into the fridge crisp (and delicious) and well before they have a chance to get old they will be gone, and you will be sad, but you can make pickles again. It's as simple as that and with a few practice attempts under your belt you'll wonder why you haven't been doing this forever. They are that good. Have you made your own pickles or sauerkraut before? Tell us all about it in the comments and consider sharing your favorite recipe. If you're nervous about getting started or if you have any questions put that in the comments too, I'll be happy to try and put your mind at ease before you begin.